The new Cartegraph-Esri connection enables local governments to better integrate operations management workflows with spatial analysis. Local governments are now seamlessly merging operations management and spatial analytics. Software company Cartegraph, a leader in helping state and local governments solve day-to-day operational problems, has integrated more closely with Esri by creating the ArcGIS Identity, which all Cartegraph customers must use to log in to Cartegraph’s systems. This lets Cartegraph and Esri users share more information, which leads to more accurate and efficient decision making. “It allows them to have more seamless interaction between their traditional GIS workflows and their asset management workflows,” said Esri director of business development Jim Higgins. “It brings together all the different workers in an organization”—GIS practitioners with field staff with knowledge workers. 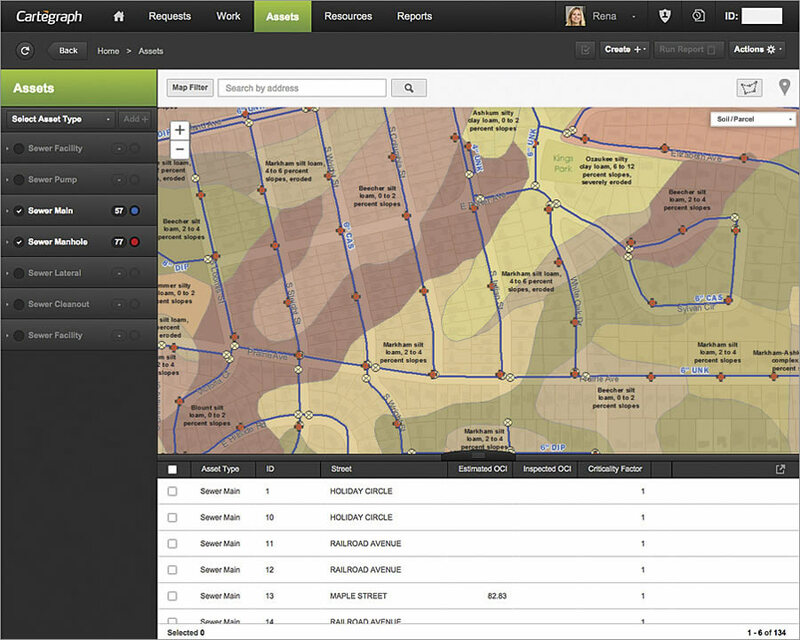 Combining the asset management capacity of Cartegraph’s Operations Management System and the spatial analysis capabilities of the ArcGIS platform means that local governments can manage enterprise assets for facilities, public spaces, and infrastructure in tandem with the work, resources, and requests they normally administer. It also gives users more context. “We can now answer more questions about why,” said Cartegraph president and CEO Jake Schneider. If a wastewater utility notices that sewer pipes in a certain area are failing, it can overlay its data with a map of soil types to see whether the soil in that area is corroding sewer pipes. If a particular part of town tends to experience more vandalism than other areas, a local government can use a streetlight map to determine if the least-lit areas are more prone to deliberate property destruction. And, crucially, Cartegraph—an Esri Gold Tier partner—doesn’t have to build this new functionality from scratch; it’s already there via Esri. Cartegraph’s Esri consultant, Brant Scheidecker, expressed the significance of this move, saying that aligning with Esri takes this kind of technology to the next level. This new business relationship also increases awareness about both companies and their products. As Scheidecker outlined, if a local government is taking asset inventory, it can consult Cartegraph to figure out which tools would be most useful. GIS specialists might make better use of Esri’s Collector for ArcGIS, while fieldworkers may be more comfortable using some of Cartegraph’s mobile devices. Either way, the tools communicate adeptly with one another, allowing for real-time exchange of information between platforms. The ArcGIS Identity is just the beginning of the Cartegraph-Esri connection. Cartegraph is currently exploring how additional ArcGIS capabilities can serve its customers in an even more fine-tuned way. “We’re making sure that we stay on the cutting edge of technology as advancements come out,” said Scheidecker. Find out more on how the Cartegraph and Esri platforms work together.